Rene Arsene, aged 93, passed away peacefully and comfortably in her home at Cedar Creek, Lethbridge. She was predeceased by her husband George, and survived by her three children, April, Colly (Chuck), George Harris, granddaughter Amy, and great grandson Adam. Rene was born in Gainford, Alberta, a small town outside of Edmonton. She spent her early school years in the Edmonton area, and then started her career path as a student nurse at the Misericordia School of Nursing (Edmonton). Following her graduation, she and her good nursing friend travelled extensively throughout the United States for almost 5 years, working in obstetrics, surgery, emergency, and as an emergency air transport nurse. Along the way, she met her husband George, and moved to Lethbridge to spend her days as a wife, mother, and a nurse. Once settled in Lethbridge, Rene nursed at the Galt Hospital, the Bigelow Fowler Clinic and then finished her career in the Lethbridge Municipal Hospital. Here, she enjoyed the challenges of being head nurse of the Surgical and ICU departments, a director in her professional association in Edmonton, and shortly before her retirement in 1985, took a leadership role on the steering committee for the building of the new Chinook Regional Hospital. Her chosen career was one of her true passions and she served it well. Rene and George enjoyed their retirement together – and when they were not travelling “down south” they were enjoying many picnic filled road trips to visit family and friends. They both shared a love for community volunteer work and Rene especially cherished her volunteer time as President of Meals on Wheels, and her years with the Heart and Stroke Foundation. 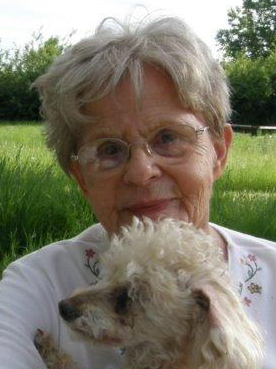 Rene’s love of dogs, and of being outdoors endured to her last days. Her generosity of spirit and appreciation of kindness and for the simple things in life were never far from her. She loved her family and friends fiercely and taught those around her the value of hard work, commitment to their chosen pathways, and above all….grace and courage in the face of adversity. The family would like to thank all the special staff and caregivers at Cedar Creek for their kind and devoted care of Rene during her 4 years with them. A Memorial Service will be held on Wednesday, September 5, 2018 at 1:00 p.m. at St. Augustine’s Anglican Church, 411 – 11 Street Street South, Lethbridge with The Rev. Canon James Robinson celebrant. Interment will follow in the St. Patrick’s Cemetery. In lieu of flowers, donations to the Alzheimer Society of Alberta would be appreciated.